What counts as exercise for youngsters? Anything that involves moving! Children exercise all the time without even knowing it. Running, jumping, dancing, touching their toes, crawling, playing sports or outdoor games; all of these are forms of exercise. Exercise can also be a great way for families to spend quality time together. Research has shown that families who regularly eat dinner together are happier and their children have more self-confidence; this also applies to families who participate in activities together. Going hiking or playing games together is a good way to exercise. Keeping children’s muscles and bones healthy is especially important because they are growing. A healthy combination of diet and exercise in childhood generally leads to adults with healthier lifestyles. Although children should never be told to “watch their weight,” parents should ensure that that their children are eating well-balanced diets rich in whole grains, vegetables, fruits and lean protein. An added benefit of exercise? Children who play sports and are physically active develop higher self-esteem and do better in school. As a (former) pediatrician and child psychiatrist for three decades, I increasingly respect the significance of children’s fears in shaping our shared everyday lives. Inconvenient though fears of the dark, animals, water, and monsters may be, they are meaningful clues about what children are trying to master about their world. Fears appear like clockwork in childhood. The adrenalin fears stimulate heightens learning of vital lessons, like when to run in the face of real danger, when to cry for help, and eventually to distinguish what is really dangerous (speeding cars) from what is not (family dog). Fears only seem to emerge ‘from nowhere.’ Actually, they typically surface during periods of accelerated development – when children lose their old equilibrium while looking for a new one. Actively toilet- learning toddlers are often more afraid of the dark than before or after they get the potty thing solved. Stranger anxiety begins when children start to crawl around and need to be more aware of who knows them and who doesn’t. Other common fears which emerge and fade with predictability during preschool years may be insects, animals, loud noises, the dark (and its imagined inhabitants – monsters, witches, ghosts), high places, and parental loss to name a few. Listen thoughtfully to your children as they describe their fear. Their fears have their reasons, though they may not be instantly clear to you. Reassure your children that you’ll help them feel better- get your flashlight out and check under their bed. Cuddle them a little extra during such times, and let them slip back toward babyhood a little. Finally, when children work it out, remind them that they worked it out. This will help them as new fears emerge. It is never too early to talk to your children about tolerance and diversity. Studies have shown that by ages three and four, children have an awareness of the differences in other children. They can recognize variation in skin color, language and customs as well as recognize obvious differences. Cultural and lifestyle differences are common in everyday life, and may be confusing for young children. To help your children become more familiar with differences, start on a small scale. A solid understanding at a young age will encourage acceptance as they grow. Teach your children about their family history. Make a family tree together and explain customs or traditions your family practices. Dress up like your ancestors and cook an ethnic meal to help your children understand their family’s culture in a fun way. Teach your children about other cultures. Ask your children’s friends or classmates to teach them about their cultures (e.g., holidays, celebrations) and lifestyles. In turn, encourage your children to do the same. Make diverse friendships and encourage your children to do the same. Show your children the most positive way to interact in the world. Make diversity a part of everyday life. Fill your home with multicultural art and literature. Take your children to museums and libraries to provide them with as many multicultural experiences as possible. There are a myriad of developmental skills that children learn through play. From their infant to Pre-Kindergarten stages, children are experiencing and learning new things each and every day. With play consuming most of their time, there are different things children learn during every stage of their growth. Infant to Six Months: Everything is a baby’s first. For example, the first time a baby opens his eyes in his bassinet, he discovers something new – an animal on his mobile. The next morning, there it is again. Will it be there tomorrow? Yes, and then baby learns to trust that when he opens his eyes he will always see the mobile’s giraffe looking back at him. Babies will engage in play first by responding to sounds, then by following objects and people with their eyes. Your baby will demonstrate his memory by repeating an action that made you laugh yesterday. Once infants can hold a rattle a whole new world opens up – you will watch them turn it over, bang it, shake it and even taste it. Rolling over also widens a baby’s world from what is placed before him to 360 degrees of eye-catching curiosity. The new world is fun. Six Months to One Year: Baby is now his own driving force to play. He no longer needs an adult or older sibling to spark his interest. Rolling over and sitting up has created choices and as he discovers how to move from lying to sitting, he is covering ground and taking aim at his own source of interest. Place toys within and outside of your baby’s reach to encourage self-discovery and motion. Your child is brilliant and will look at a familiar object when called by name. Babies not only want to turn objects around, they want to talk to them and use them the way you tell them to use them. See my hands! You say “clap” with a smile on your face and baby wants to clap and smile, too. First Steps (12 to 18 months): No longer a baby, a First Stepper “steps” into everything. A First Step child will play with water, smell a flower (which is not as easy as you think) and recognize animals like the ones from the mobile. He will join in the conversation with simple words and phrases and respond to “bye, bye,” with an unsolicited wave. One-year-olds love to demonstrate their knowledge – they will point to anything you name and find body parts, like their ears, when they cannot even see them. They have learned to trust their own experiences with their ears. Your one-year-old will play with you and imitate your actions. Watch your child reflect your love a baby doll with “hugs and kisses” and help you the way you have guided him. Toddler (18-30 months): A toddler’s world is all about ME – “Me do it”! This demonstration of independence is an exercise in trusting the child’s own limits. A toddler will speak on a play phone and answer questions such as “Why?” and “Where?” Playing is on his terms – when and how. Toddlers love new experiences, too. They have graduated from ‘turning it over and tasting it’ to doing it right. A toddler will put a puzzle together, hold crayons in his hand, hum and sing as he plays, and join activities without prompting. Give your toddler plenty of opportunities to join in imaginary play – pour from one cup to another and manipulate play dough. Get Set (30 to 36 months): Just like the name states, get set for more play. The Get Set child is truly developing an identity. He knows his own name – first and last – and can tell you where his friends are playing. Get Setters know ‘they can do it’ and want to be like adults. They will share and wait turns, communicate in short sentences and demonstrate their personal understanding of the world around them in their play. Get Set children will soak up any information you share with them. 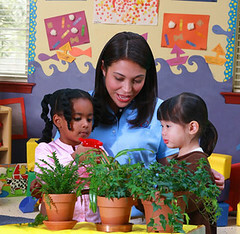 They can understand words like “under” and “over” and the description of how a plant grows. Art is no longer about exploring the material itself, but rather what they can do with the material. They will even paint with the opposite side of the paint brush just to see what it will create. Get set for your child to amaze you with his knowledge of good hygiene and specific book choices. A Get Set child can also multi-task now; try singing and doing the motions to the song or have a conversation while he paints. Preschool (36 months +): This is the age of expectations. The preschool child’s play looks like going to work. As he mingles among the Interest Centers he is also playing out a role. Preschoolers have a large vocabulary and understand the intonations of language. As they act out a role, they will try on different emotions and see how they fit into their own personality. Preschoolers have begun to connect the spoken word to written language and can orally retell a favorite story. They are interested in cause and effect and can identify their colors, shapes, sizes and weights; and they want to explore what happens when they change them. A preschool child may remain in a particular Interest Center for long periods of time until he has exhausted his curiosity. Don’t forget to stand back because the preschool child also needs his space to move. 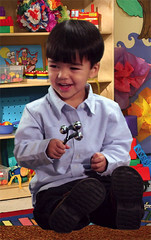 Watch as he develops rhythm and tempo as both an individual or group learner. Either way, preschoolers are movers and shakers. Pre-Kindergarten (48 months +): Complexity is the nature of the Pre-K classroom. Pre-Kindergarteners are complex social beings wanting to play with specific friends and still identifying when they want to do it alone. They can recognize how objects and people are the same and different simultaneously, and they can appreciate those attributes. Playing is beginning to turn into concepts. For instance, all of the exploration at the water table develops into an understanding of water – floating, sinking, absorbing, dissolving, etc. Pre-K children use their four years of play experience to develop an identifiable knowledge – they can match by relationships and verbalize invisible concepts, such as time and calendars. They no longer need to see or hold the toy to play; they can recall previous experiences and use the knowledge. While listening to music they can name the instrument, move to the beat and sing along. In Pre-K, phonemic awareness and the written word are magical – writing words is play. Brain research tells us that, of the 100 billion (!) nerve cells we are born with, the ones we are most likely to keep longest are the ones that are used regularly in our interaction with the world around us. This does NOT mean that we can increase our child’s intellectual or developmental competence through so-called ‘brain stimulation’ videos or surround-sound cribs. Infants and toddlers enjoy learning first and best the things they learn in their relationships with the people that care for them. Children can distinguish the voice of their father from their mother at birth – and their handling styles at six weeks. Want to encourage a positive self-image? For babies, tender and frequent touch makes them feel treasured, and for toddlers and preschoolers, install a (safe) full-length mirror on the back of a door and provide dress-up or ‘pretend’ clothes and just watch them feel special. Keep your eyes and ears open for emerging motor skills, interests, words, emotions, and feelings. When such competencies are new, they are both adorable and vulnerable. Remember not to overwhelm children by requesting a ‘show’ of their new tricks. This can be over-stimulating and cause quite the opposite effect – anxiety about new abilities instead of confidence. Let children practice and enjoy their new skill. HOW you are as a parent with your children matters far more than any particular thing you may ever DO with them. Development is not a race; it is a process that unfolds uniquely in each child. Rushing development erodes children’s belief in, and joy of, their own emerging abilities, replacing joy with frustration and discouragement – too high a price in my book. Children have an innate appetite for music. Music is the superb para-language between emotion, expression, and imagination. Here in the musical world, feelings come together with play, movement, and memory in a way that is not ultimately dependent on language. And that is precisely why it is so indispensable to the young child across culture and class. All young children, even those with only minimal hearing, have a powerful, almost riveting affinity for music. Research has shown that the fetus responds to musical cues from the middle trimester onward and never stops attending to it afterward. And infants are the same. Watch an infant’s face as you sing or play music. Even words rarely elicit such a complex reaction. The desire to move and bounce to, kick feet to, rock back and fourth to – even match the mood of – almost any musical stimulus is powerful in most children. By the era we are discussing, play with music is so complex and rich, it probably teaches more economically than any formal kind of instruction. The neurobiological processes underlying the appreciation and facilitation of music-assisted play and interaction involve the brain pathways for memory, hearing, balance, motor control, hormonal secretion, cognition, and, of course, emotion. Talk about a big bang for the developmental buck! Take the simple circle song “…all fall down” (I grew up with the version, “Ashes, ashes, we all fall down,” at which point everyone collapses to the ground while still trying to hold hands). What is the expression on the child’s face as he anticipates the collapse, knowing exactly what is about to happen, evoked repeatedly by the senseless musical cue? What role does cooperation play? Motoric competence? Interpersonal interest? Memory? Emotion? Shared emotion? Imagination? Which element is primary? What else in our world can stir such a mutual response across generations and cultures? I can’t think of a thing. An estimated five million children are in preschool programs, and the number is growing. According to the Families and Work Institute, children benefit from quality programs with competent staff and good ratios. They suffer fewer behavioral troubles, have larger expressive vocabularies, feel close to their teachers, and enjoy more complex, less aggressive play with peers. A high-quality preschool curriculum sets specific goals and uses learning and developmental standards that are age-appropriate. The curriculum builds on each child’s interests and natural curiosity and also allows them the opportunity to direct their own learning. Whole-class and small group activities as well as opportunities for individual interactions with the teacher are encouraged. Preschool benefits children, their families and their communities. Children in quality preschool programs show improvements in the development of social skills and are more proficient in areas such as following directions, waiting turns, problem-solving, joining in activities and relating to teachers and parents. These advanced skills improve efficiency in classroom settings which allow teachers to spend more time working directly with children and less time on classroom management. Studies have shown children that have attended preschool are more likely to do better on standardized tests, graduate high school and earn higher wages as an adult than their peers who did not attend preschool. They are also less likely to repeat a grade, to be arrested for a violent crime or to become teen parents. At The Goddard School®, children are encouraged to explore learning centers including art, math, science and computers; to ask questions; and to take time making friends and socializing. The school focuses on building a strong and balanced foundation for each child and encourages them to develop at their own pace while supported by a team of dedicated teachers. The Goddard School FLEX Learning Program™, based on the latest research in how children learn and designed with the assistance of experts, provides the optimal environment for the development of young children. The program’s foundation is the learning continuum that encompasses developmental guidelines with formative assessments, child-focused lesson plans, a creative and fun environment and a personalized child-centered approach that meets each child’s needs.